Glamping in Iceland - What is it and where to go glamping? Adventure Tourism has been on the rise all over the world in the last few decades with travellers seeking ever more authentic adventurous and Eco friendly experiences. In Iceland the variety of adventurous activities, travels and accommodations has exploded and the country is becoming one of Europe's top locations for all things exotic and exciting. With this relatively new trend, accommodation options have evolved to meet the needs of the ever adventure thirsty travellers and without further ado the next big thing in adventure tourism is here! GLAMPING! Glamping stands for glamorous - camping, and that is exactly what it is. Glamping is spending time out in nature using comfortable and stylishly furnished tents and rustic cabins for accommodations. Glamping is the luxury version of the traditional adventure travel. 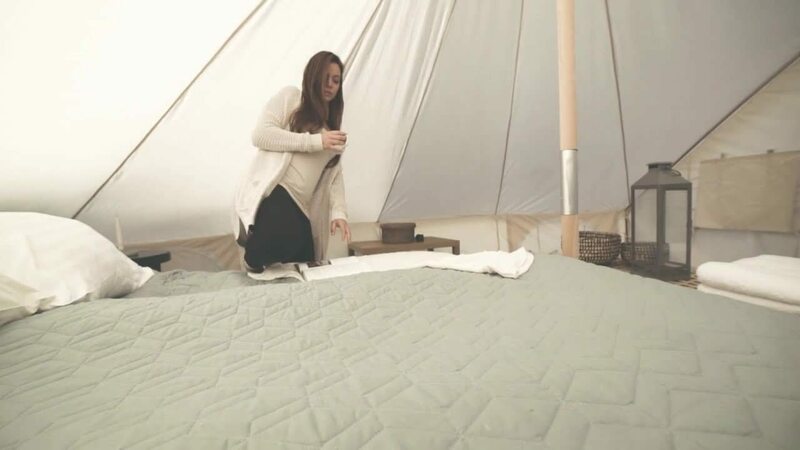 When glamping you are connected to the wild outdoors but are still able to sleep in a dry, warm and cozy place. Glamping can also be very eco-riendly as the setup of tents and rustic cabins does not affect the environment as much as big hotels and resorts do. Glamping in that sense embodies sustainable development and gives access to nature in a way that no large hotel or resorts could do. Aren't we all looking for that unique experience? Something that is authentic and real, environmentally friendly (but also Instagrammable of course;). Even though the term “glamping” is relatively new this is not a new idea at all. Throughout history kings and nobles have been camping and traveling glamorously around the world as far back as to the times of the Mongol and Persian dynasties and even longer. Roman emperors traveled their territories and brought with them all the luxuries imaginable. This stylish way of traveling meant large furniture, Persian rugs, luxury bedding, cases of wine and even bathtubs! All this was carried out by large caravans with great effort. Today, there is a great variety of glamping options in the world. Some places have underwater pods, there are yurts, ice hotels, cabins, tipis, and even tree houses. In the UK glamping has even become a popular accommodation during music festivals. The Volcano Huts have now set up a glamping hub in Iceland for the adventurous explorers. Click here to check availability and book your glamping holiday in Þórsmörk. Where can you glamp in Iceland? Þórsmörk Nature Reserve is the place to go glamping in Iceland. The Volcano Huts offer glamping in stylish comfortable tents and the more rustic mountain cabins. The tents are located in a beautiful nature enclosure with access to some of the best hiking trails in Iceland. Glamping in Þórsmörk offers a unique experience and close encounters with the nature and wildlife. The nearby restaurant and bar has a lively scene where you can meet and shared stories with hikers coming down from the famous 4 day long Laugavegur Hiking Trail. Getting to Þórsmörk is an adventure in itself. You will have to cross many rivers on the way up road F249 into Þórsmörk. We recommend hopping aboard the highland bus that takes you safely across the rivers into Þórsmörk. Renting a Land Rover Defender is also a great way to get around in the highlands and maintain the retro look with the glamping experience. Þórsmörk Valley is nestled between three glaciers: Tindajökull glacier, Eyjafjallajökull glacier and Mýrdalsjökull glacier. This valley is often described by visitors as a haven for hikers as it has some of the most beautiful trails in Iceland. Glamping is an ideal way to experience the Northern Lights or the Aurora Borealis. Earliest signs of the Northern lights can be expected from late August and the beginning of September. The tent allows you to stay in your bed and simply by zipping up your tent and peaking out, you can keep an eye out for the Northern Lights. Iceland’s location on the Northern hemisphere is perfect for seeing the Northern Lights. Conditions in Þórsmörk to see the Northern Lights are also often very good for its secluded and sheltered location in behind the glaciers. Northern Lights are visible in Iceland between August and May which is a perfect time to go glamping. The tents have made up beds for two - four people. They are furnished with the stylish furniture, a heater and plenty of warm blankets. Close by are the shared bathrooms and the main building has free WiFi. The glamping tents in Þórsmörk also come with access to the LavaSpa sauna and pool. There is really nothing like waking up nestled in this highland valley, surrounded by stunning nature and warm natural pools. After breakfast at the Volcano Hut restaurant you should head out hiking as Þórsmörk has some of the best hiking trails in Iceland. Glamping in Þórsmörk is a great way to just get off the grid for a day or two, beat the crowds of the tourist traps and meet other like minded people around the campfire in a beautiful natural location. Is glamping available all year in Iceland? The glamping tents in Þórsmörk Nature Reserve available from May until October each year but can be set up for groups during winter by request. Þórsmörk is a unique destination as it is at feels very remote but the same time is only 3 hours away from Reykjavík and only an hour away from the nearest town. The area can be accessed by the highland bus or by foot. No matter what you plan to do in the outdoors in Iceland we always recommend dressing warmly. It is always good to plan your clothing in layers. That way you can easily balance your body heat by putting on or taking off clothing. You need an insulating base layer, warm second layer and wind and waterproof outer layer. Iceland has mild weather during summer but most of the year you need to be prepared for all conditions: Rain, wind and snow. Wool is the perfect base layer. It breaths and dries quickly and is warm. Fleece is a good second layer as it is light and warm. Waterproofs should be your outer layer and don´t forget to pack a hat, gloves and woollen socks. We recommend that you also bring swimwear so you can make use of the sauna and pool. In bed, we recommend keeping the warm underwear handy as the nights can get be cold in Iceland and this will keep you extra warm and snuggly even though you kick off your duvet while sleeping. Click here it read our staff’s recommendations for what to bring on your hiking and glamping adventure in Þórsmörk. The cost of glamping varies and is very dependent on each location and concept. Usually the cost can be compared to the cost of staying in a 3 star hotel and upwards although some establishments do offer much cheaper and more basic options. For prices of glamping in Þórsmörk please click this link.